Glens Falls, NY – The Hyde Collection’s newest exhibition, Thomas Chambers (1808 – 1869): American Marine and Landscape Painter, is the first survey seeking to define the artist’s style, sources, and the audience for his mid-nineteenth-century landscape and marine paintings. The exhibition, runs through Sunday, April 19, 2009, includes fifty-four works from private and public U.S. collections. Forty-five paintings are by Chambers himself and these are complemented by related works of his contemporaries. 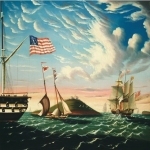 Many of English-born Chamber’s paintings from his first thirty years in the United States depict New York and Massachusetts landscapes, as well as marine-related subjects. Chambers has been celebrated as an American folk painter whose style anticipated the modern American taste for contour, lively pattern, and strength of color. 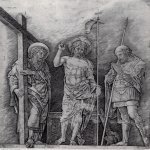 The exhibition is organized by the Philadelphia Museum of Art and its Center for American Art, in association with the Indiana University Art Museum, and is curated by Kathleen A. Foster, The Robert L. McNeil, Jr., Senior Curator of American Art and Director of the Center for American Art. It was supported by a generous gift from Mr. and Mrs. William C. Buck. The Hyde Collection is the second stop for this traveling exhibition, which first appeared at the Philadelphia Museum of Art in fall of 2008. Following its display in Glens Falls, the exhibition will be on view in 2010 at the American Folk Art Museum in New York City and the Indiana University Art Museum in Bloomington, Indiana. The curator of Thomas Chambers (1808-1869): American Marine and Landscape Painter, Kathleen A. Foster of the Philadelphia Museum of Art, will speak at the exhibition’s closing reception at The Hyde on Sunday, April 19, 2009. Sponsors of the exhibition at The Hyde Collection are SCA Tissue and NBT Bank. The Hyde Collection is a historic house and art museum complex with a distinguished collection consisting of works by American and European artists such as Botticelli, Rubens, Rembrandt, Picasso, Homer and Eakins, as well as important decorative arts and antique furnishings. The Museum provides changing exhibitions in two gallery spaces, lectures, concerts, family activities and school programming, as well as a Museum Store. Admission is FREE with voluntary donations welcomed. The Hyde Collection is a non-profit institution located at 161 Warren Street, Glens Falls, New York. Open year-round Tuesday-Saturday 10 am - 5 pm and Sunday noon - 5 pm; closed Mondays and national holidays. For information, visit www.hydecollection.org or call 518-792-1761.